Whether you're just starting out with the 40 standard rudiments or looking to expand your rhythmic vocabulary into odd rhythms, latin grooves, or heavy metal, theDrumDictionary gives you the tools you need to bring your drumming to the next level. With built in practice tools and audio examples for every rudiment and beat, theDrumDictionary is the perfect quick reference as well as a great companion for the practice room. Hear each a recording of each beat/rudiment and get a feel for the groove. With adjustable tempo, play along as slow as you need to to learn, or speed it up for an extra challenge. 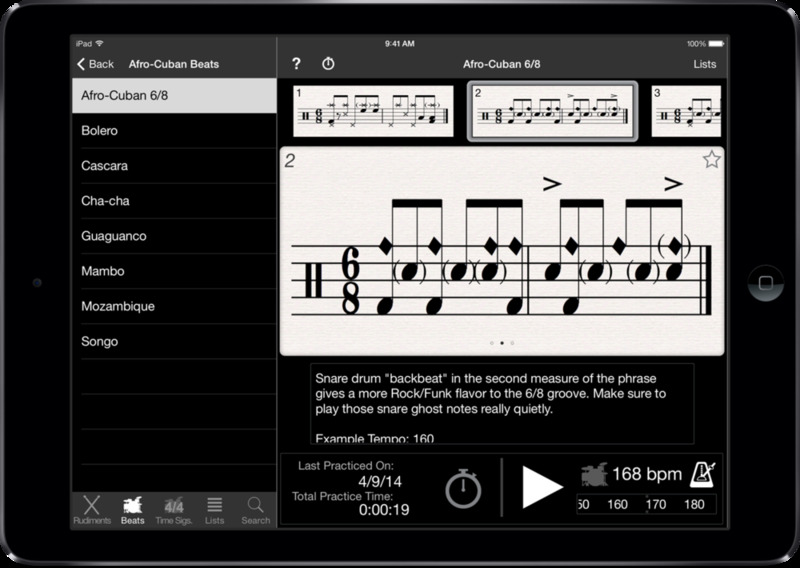 With a built-in metronome there's no need to run multiple apps simultaneously. Keep your eyes on the notation as the metronome keeps you on beat. Tips for every beat and rudiment: what to watch out for when learning a particular style, quick suggestions for applying rudiments to the drum set, practice tips. Track the total time you've spent rehearsing each beat/rudiment, as well as the last time it was practiced. All 40 standard rudiments and over 100 beats in a variety of styles. Made for iPhone, iPad and iPod touch. Free version available for those who want to give it a test run. Portrait view on iPhone gives you all the information for each beat on one screen. Or, rotate to landscape to focus on the notation.